Indonesian President Joko ‘Jokowi’ Widodo said that his working visit to Russia aims to enhance strategic cooperation with Russia on economic, investment, and defense sectors. 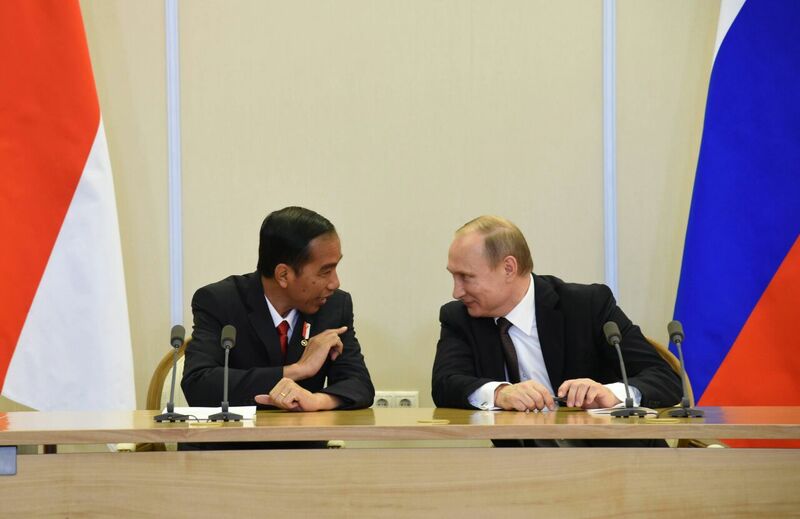 “We believe that there are ample opportunities to establish economic cooperation between Indonesia and Russia and we have agreed to cooperate to remove tariff and non-tariff barriers, including on palm oil,” President Jokowi said in a joint press statement with President of Russia Vladimir Putin after a bilateral meeting on Wednesday (18/5), at the Bucherov Rucey, Sochi. Both leaders have also agreed to continue encouraging Russia’s investment in Indonesia, particularly on maritime and infrastructure sectors. “For example by investing in railway and seaport projects in Kalimantan as well as on fuel, energy, and electricity sectors,” the President said. The meeting also produced an agreement to strengthen cooperation on defense, technology transfer, joint production, as well as education and training. “We will continue cooperating to eradicate terrorism and we also have agreed to improve intelligence data exchange against terrorism,” the President added. In the tourism sector, both leaders have also agreed to promote tourism so that more tourists will visit each other’s countries. “It is an honor for me to invite President Vladimir Putin to visit Indonesia,” President Jokowi said at the end of his statement. The agreement between the Government of Russian Federation and the Government of the Republic of Indonesia on D The agreement was signed by Russian Foreign Affairs Minister Sergei Lavrov and Indonesian Foreign Affairs Minister Retno Marsudi. Memorandum of Understanding on Archives Cooperation between the Russian Ministry of Foreign Affairs and Indonesian Ministry of Foreign Affairs which was signed by Foreign Affairs Ministers of the two countries. Cultural Cooperation Program between the Ministry of Culture of Russian Federation and Ministry of Education and Culture of the Republic of Indonesia for the period of 2016-2018 which was signed by Russian Minister of Culture Vladimir Medinsky and Indonesian Minister of Foreign Affairs Retno Marsudi. A Joint Statement between Russia’s Federal Agency for Fisheries and the Indonesian Ministry of Maritime Affairs and Fisheries on Prevention of Illegal, Unreported and Unregulated (IUU) Fishing which was signed by Russian Deputy Minister of Agriculture/Head of the Federal Agency for Fisheries Ilya Shestakov and Indonesian Minister of Maritime Affairs and Fisheries Susi Pudjiastuti.